What's a band to do to keep things fresh after 25 years together? While some bands may choose to phone in a greatest hits retrospective, split into solo projects or simply just "pursue other interests," Cowboy Junkies has decided to embark on one of their most creative and prolific times with "The Nomad Series." It's projected to span a book and four albums and Renmin Park is the first release. Inspired by a three month family trip to China, guitarist and principal songwriter Michael Timmins created recordings of the music, sounds and conversations of the people in the city of Jingjiang. These elements were used to augment the bluesy, alt-country vibe of Cowboy Junkies to create a colorful album that tells a love story marred by separation. Renmin Park opens up with a collage of marching band blasts, snippets of a Chinese folk song, car sounds and the chatter of the city. While it's uncharacteristic for a Cowboy Junkies album, it's used as a great tool to set up this concept album. The Timmins siblings, Margot on vocals, Michael on guitar and Peter on drums, are intent on making sure that, while this album is ambitious and creative, it's still a tried and true Cowboy Junkies album. The first song, "Renmin Park," is unmistakable Cowboy Junkies with Margot's husky, breathy vocals floating above Michael's plaintive acoustic. However, the first line, "Meet me on the banks of the Yangtze," transports the listener to the Chinese setting of the story. The next track, "Sir Francis Bacon At The Net," uses a loop made of group aerobics and a badminton game as the rhythm track for the slow, electric blues jam. "Stranger Here" really picks up the feel of the album and is probably the most accessible. This track could easily show up on a radio playlist or in a movie, but it will most likely find it's home on countless personal summer road trip soundtracks. "A Few Bags Of Grain" addresses China's views on the female gender and was inspired by Michael's trips to the orphanages where two of his daughters were adopted from. It's a heavy topic that is approached with a depth of emotions and a gentle musical paintbrush. Cowboy Junkies also wanted to showcase some of the great Chinese songwriters with covers of "I Cannot Sit Sadly By Your Side" by Zuoxiao Zuzhou and "My Fall" by Xu Wei. These songs are translated into English and prove that great songwriting is not bound by language barriers. When Cowboy Junkies apply their deep musical knowledge and talents to a specific vision and direction, no matter how diverse the topic, the outcome is mesmerizingly rich and ornate. 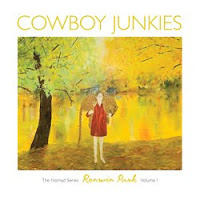 If all you know of Cowboy Junkies is their 1988 cover of The Velvet Underground's "Sweet Jane," you'd be doing yourself, and the band, a disservice to not pick up Renmin Park. Be prepared to be blown away by the beautiful blend of Chinese culture, American music and the universal threads of life, heartache and love. Renmin Park can be picked up on June 15th through the band's website HERE or through their label, Latent Recordings.